Unfortunately the manufacturers of Banzai Energy Drink have not disclosed the levels of caffeine in their product. 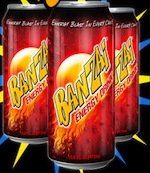 Banzai Energy Drink has 3 flavors, one of which - Original - is available in a 16oz can. (The other flavors "Banzai-Blue" and "Sugar-Free-Banzai" are only available for on-tap distribution in clubs and bars). Otherwise, Banzai is a fairly typical energy drink recipe that is said to have less corn-syrup flavor and caffeine-aftertaste than its competitors. Water, sucrose, fructose, citric acid, taurine, sodium citrate, maltodextrin, natural and artificial flavor, sodium benzoate (as a preservative), caffeine, inositol, caramel color, niacin, d-calcium pantothenate, pyridoxine hydrochloride, calcium phosphate, and riboflavin.